Soil pH meter electronically determines soil pH level. Soil testing in about one minute. Comprehensive guide lists ideal pH ranges for over 350 plants. Requires 1 AA battery. 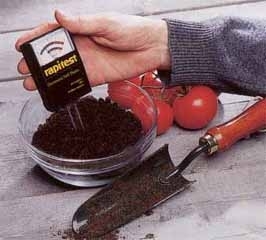 Rapitest soil test kit performs 10 total tests for Soil pH. Attractive manual gauge for container or garden bed. Includes 3 ft. adjustable plastic mounting stake. Soil tester includes 5 color coded test tubes and a comparison chart to test the pH and or the fertilizer levels in your soil.